Hyderabad Youth Mirror (HYM), an online magazine for students and youth, announced its second annual state-level essay writing competition today. 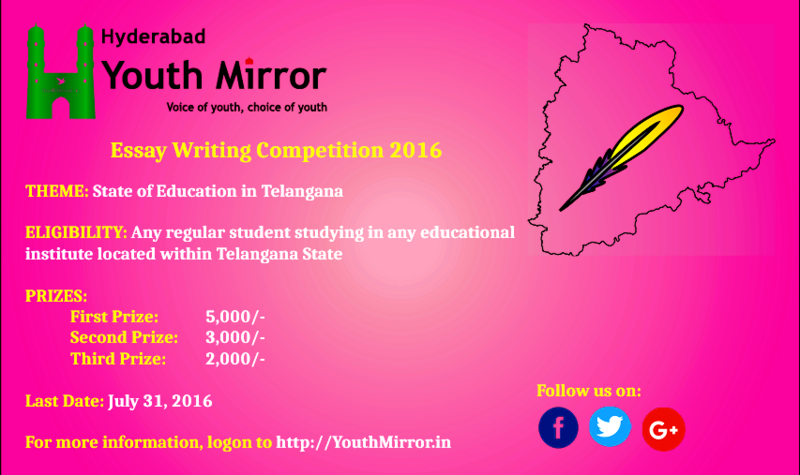 Theme for this year’s competition is “State of Education in Telangana”. Editor of the magazine said that students who are pursuing graduation, post graduation, or research in any educational institute located within the state of Telangana can take part in the essay writing competition. Students willing to participate must have to send the essay in English before July 31, 2016 at [email protected] with subject “Essay Competition 2016”. It must be noted that word limit for the essay is 2,000 words. HYM Editor Fasiullah SM noted that the participants are expected to highlight both salient features and loopholes in the existing school education and higher education system, in addition to proposing ideas to improve overall quality of education. The participants need to clearly mention their full name, course, and institute name. Also, they have to provide address and mobile number. According to the magazine, only regular students can take part in the competition. First prize is 5,000; second is 3,000; and third is 2,000.